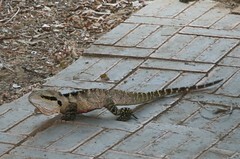 This magnificent lizard has been living at our place for the last few years. I caught him limping around the other day. It appears he’d been in a fight with either a cat or another lizard, and wasn’t walking very well. So I called the RSPCA who came out, captured him and took him to their animal hospital. They tell me when he’s better they’ll bring him back home here, where everything is familiar to him.